From left to right are Coach Kris Shoemaker, freshman Stacie Miller, senior Dana Vandenbrink, sophomore Becca Payne and Coach Mark Tompkins of the Grand Valley State hunter seat team. 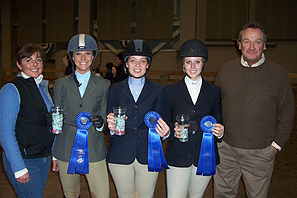 Miller, Vandenbrink and Payne won blue ribbons in each of their over fences classes to start GVSU on their way to a season-high 44 points on January 12th. East Lansing, MI - For years the Michigan IHSA hunter seat programs competed in the shadow of a dominating team in Zone 6, Region 3 located in Findlay, Ohio. Routinely among the top three was Otterbein College, also located in the state known for Indians, Browns, Bengals and Reds. Otterbein even won Region 3 twice in the late 1990's. However through good fortune a half dozen teams sprouted up in Michigan as the 21st century progressed, and thankfully many have grown to the point where their point cards are routinely full or close to it. As recently as the 2004-05 season Adrian College, Calvin College, Central Michigan University, Ferris State University and Oakland University were not yet competing within the IHSA. Saginaw Valley State University had previously fielded a team but the program vanished for a few seasons before being reborn in the fall of 2007. The numbers finally became so big in Ohio and Michigan that a split was necessary. Although the Zone 6, Region 4 name existed from 1997 to 2002 (given to a group of schools which are now found mostly in Zone 9, Region 3), the name was also reborn in the summer of 2007 to describe the 31st and most recently added IHSA region. And the easiest way to split it was to make Michigan a region all of its' own. Michigan can claim to be the only state in the union where all IHSA programs are in one single region and in no other states or Canadian provinces. If you go to school in Michigan and ride in the IHSA you can rest assured that you will not compete out-of-state during the regular season nor that you will miss the opportunity to compete against a Michigan school in another region. And only in this 2007-08 season can you ride for a Region 4 team which will capture its' first region title ever! Entering the January 12th Michigan State show the team in the driver's seat to win their first region title was the University of Michigan. Coached by Jennifer Blades, the Wolverines held a 285-266 advantage over second-place Albion College at the start of the day. The Wolverines had also been among the most consistant, scoring exactly 35 points at three of the fall shows, while scoring 38 and 42 at the others. Their 42 score at the Grand Valley State show was also the top score of any Region 4 team to date. However when you have a new region records are bound to be broken more often than not, and on this day the Wolverines would see another program set the new Region 4 season-high. The good news is that the Wolverines scored 38 again and even widened their lead for high point team with only one show remaining before Regionals. Through the over fences divisions only two teams had any blue ribbons, and one of them was Oakland. From left are Chrissy Dubay, Molly Disend, Oakland Head Coach Christopher Ewing, Andrea Zoltek and Katie Krauss. Disend won her open fences, Dubay won her intermediate fences and Zoltek won her novice fences. Krauss was second in a separate section of intermediate fences. The Golden Grizzlies went on to score 40 points, which appears to be the most in the program's three-season history. Originally to include only one section each of open and intermediate fences, the decision was made shortly before the show started to split these divisions so that more riders could earn points and perhaps qualify for Regionals. Oakland freshman Molly Disend took advantage of the split. From Rochester, Michigan Disend won her first IHSA over fences ribbon, also giving the Golden Grizzlies a quick seven points. The second section went to Grand Valley State sophomore Becca Payne. From Rochester Hills, Michigan Payne started the day only ten points out of first place in the Region 4 hunter seat open rider standings. Temporarily Payne was only six out, trailing the Wolverines' Kevin Stevens by that many after he finished second to Disend in the first section. Grand Valley made it back-to-back wins as senior Dana Vandenbrink won the first section of intermediate fences. Oakland then snapped the GVSU win streak as Team President and sophomore Chrissy Dubay won the second intermediate fences section. The third place ribbons in the intermediate fences were also noteworthy as freshman Kody Turner-Schimmel earned one of Adrian College's best ribbons of the day in the first section while Michigan State junior Nicole Sienkiewicz picked up the four points she needed to qualify for Regionals in the second section. Oakland made it two in a row via Andrea Zoltek in novice fences. The Golden Grizzlie freshman won in a field of five to give Oakland 19 points through three divisions. Just as Oakland had snapped Grand Valley's winning streak, Stacie Miller returned the favor. The GVSU freshman won the second section of novice fences, giving her team 21 points and a shot at a perfect score. However with Oakland only two points behind they too were technically still in it for a 49 accounting for the drop score. 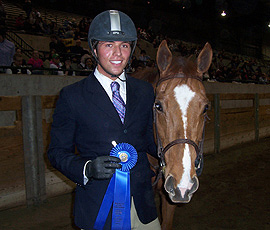 Seen here with "Cooper," Michigan State sophomore Patrick Foth was the only Spartan rider to win a class on January 12th. From Sterling Heights, Michigan, Foth won the second of three sections of open flat. Foth would also win a blue ribbon in advanced western horsemanship the next day in the first of two western shows. In spite of a low blue ribbon total on the 12th, Michigan State earned 33 points and fourth place for the day. The first six classes of the day had been completed in 68 minutes. A 45 minute lunch break was to follow. However things began to slow down at this point. The break was slightly longer than planned, with the decision made to create additional sections of open and intermediate flat. Then as the afternoon progressed there were some horses pulled and a few classes re-ridden. Though some might complain that it took over four and half hours to hold 17 official flat classes and a ride-off at least everyone was indoors inside the well-heated Michigan State Pavilion. With seating on one side of the facility for over 3,000 spectators not to mention permanent concession stands and rest rooms the Pavilion is one of the nicest structures this writer has ever seen an IHSA show inside of. Though often booked years in advance for various functions (many related to livestock) it would be a truly magnificent place for either Zones or Semifinals if the opportunity arrises. Open flat started the afternoon session, with the first "Section A" rider into the ring at exactly 1:00PM. When the class was finished Katie Krauss had delivered Oakland's fourth blue ribbon of the day. A senior from Berkley, Michigan with another year of eligibility remaining, Krauss was very happy to win the blue after earning a red ribbon in intermediate fences earlier. The second section finally saw a rider from the home team win, as Michigan State sophomore Patrick Foth came out on top. From Sterling Heights, Michigan, Foth entered the day only five points out of first in the Region 4 open rider standings, and with a first and a fourth ended the day in the same exact position. The third section went to Stevens, who added 12 points to his open total to end the day as Region 4's leading open rider with 55 points. Stevens' older brother Marshall, who rode in the open division for Grand Valley State from 2001-05 was one of several former IHSA riders on hand for today's show. Also visiting was former Michigan State open rider Ashley Delzer, who could claim to have competed against both Stevens brothers before graduating in 2006. Schools without a first up to this point continued to break through. Ferris State's Ashley Peterson won the first section of intermediate flat, giving the Bulldogs their only blue ribbon of the day. The senior from Oxford, Michigan is also the Ferris State team President and would fair even better at the second Michigan State western show 24 hours later, earning firsts in both reining and open horsemanship. 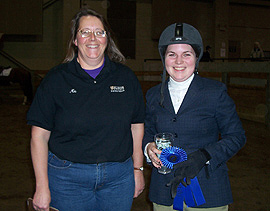 Albion sophomore Katherine Ross, who is already qualified for Regionals in both hunter seat novice divisions, won the Britons' first blue ribbon of the day in the second section while University of Michigan senior Leslie Jablonski won the third section. From the city of Detroit Jablonski pointed out of intermediate flat, having needed only a fourth or higher to qualify for Regionals. Seen here with Head Coach Mia Zetting, Albion's Katherine Ross (on right) is one of two Briton riders to have qualified for Regionals in two separate hunter seat divisions. The sophomore from Grosse Pointe, Michigan is going to Regionals in both novice flat and fences and was also a winner in intermediate flat on January 12th. Novice flat was divided into four sections, with Grand Valley State the winner in two of them. Freshman Kelsey Flanigan won the first section while another freshman, Libby Benjamin, won the third. Benjamin had finished second to Zoltek in novice fences and was one of three riders up to this point with a first and a second. Inbetween the GVSU triumphs was Aimee Depotter of Albion, already qualified for Regionals in advanced walk-trot-canter and a winner in novice flat here. 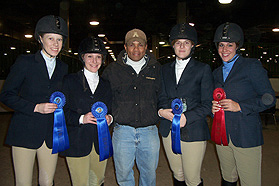 Western Michigan had not been into the blue ribbons on this day until senior Jennifer Jepkema won the fourth section. Jepkema also assured that Stevens, Krauss and Benjamin would all be in the ride-off, as no one received "Double Blues" at today's show. The ride-off was held before the start of advanced walk-trot-canter, with each of the three riders asked to walk, trot and canter in each direction by judge Mike Hansen. When everyone was lined up it turned out to be Benjamin winning the ride-off with Stevens reserve. In her first IHSA ride-off ever the freshman rider from Farmington Hills, Michigan won riding "Felix" to beat out both an intermediate and an open rider. It seemed as if GVSU could do little wrong up to this point. The Wolverines heated up in the advanced walk-trot-canter, as junior Claudia Cieslak won the first section while junior Mary Herrmann won the third. In both cases Grand Valley State riders finished second, with Beth Lubeck a placing behind Cieslak and Katie Ferraro trailing only Herrmann. In between Albion won another class as sophomore Amanda Stoyanovitch took the blue. In only their fourth IHSA show ever, Adrian College finished ninth out of thirteen schools entered. Head Coach Elizabeth "Libby" Miller (on right) poses with sophomore Brittanie Terrel after the latter placed third in walk-trot. Adrian now has 59 points over four shows, essentially averaging 15 points per contest in their inaugural season. There were two sections of beginner walk-trot-canter. Oakland picked up their final points of the day in the first section, as junior and Grizzlies Team Treasurer Lisa Hibbard took the blue. Though Oakland had a great day, the drop score had been determined before the show even started, as the Grizzlies were without a walk-trot entry. Western Michigan picked up their second and final blue ribbon a short time later, as senior Sara Long won the other section. There were six walk-trot riders in each of the two sections which concluded the proceedings. Grand Valley State sophomore Kelly Koenigsknecht pointed out of the division with a first in section A while the final rider to win a class at today's show was University of Michigan sophomore Caroline Wolcott, who boosted the Wolverines' total to 38. When the final team points were written in the High Point team award went to Grand Valley State. This marked the second consecutive show in which GVSU was high point and went over the 40-point barrier. Grand Valley State scored 44, the most of any Region 4 team so far this season. The high point total allowed them to overtake Western Michigan for third and tie Albion for second overall in the Region 4 team standings with 197. What is not clear is if this is the Grand Valley school record for points. It appears that prior to the 2006-07 season GVSU did not earn more than 40 points at any Region 3 show. Unless they scored 44 or higher last season (Campus Equestrian does not have the Region 3 hunter seat team points broken down by show for the 2006-07 season), Grand Valley has not only the Region 4 record for hunter seat points at one show but also their own program record on this day. Oakland earned reserve high point team honors for the second time this season, and they too may have set a school record by reaching 40 for the first time (and with no walk-trot rider today). The University of Michigan did not win the battle but all signs point to a surrender of the region title to the Wolverines on March 1st, as both Albion and Grand Valley State trail by 26 headed into the final show that day. If Michigan can score 24 points - eleven fewer than their low score through six shows - the region title will still be theirs no matter what else happens. 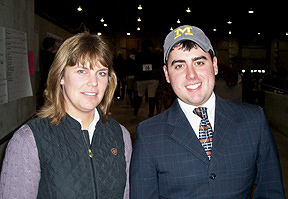 Seen here with Head Coach Jennifer Blades, the University of Michigans' Kevin Stevens moved (back) into first place in the Region 4 hunter seat open rider standings. The junior from Grand Rapids won his open flat while placing second in open fences and now leads teammate Jenna Watson (not pictured) by a narrow 55-53 margin with one show to go. 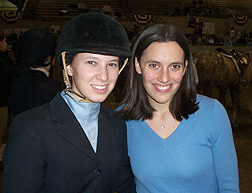 The University of Michigan also has the upper hand in getting one of their riders to IHSA Nationals before anyone else. Stevens, who at one point led the Region 4 hunter seat open rider standings before falling behind Albions' Christine Grahl, returned to the top spot. While Stevens has 55 combined flat and fences points, teammate Jenna Watson was second in both of her open classes and finished the day with 53. Foth earned ten points to finish with 50 while Grahl sits in fourth with 48. Payne basically needs a miracle to take the lead as she has 43. The open rider with the most combined flat and fences points after the March 1st Albion show will automatically advance to IHSA Nationals to compete for the Cacchione Cup May 8th through 11th in Burbank, California. Host Michigan State won four red ribbons to go with Foth's blue and finished with 33 points while Albion scored 31 and Western Michigan 24. Don't forget about us: Six schools in attendance did not earn any blue ribbons but competed nevertheless. Central Michigan University was led by sophomore Marissa Whitbey, who was second in intermediate fences, and freshman Ashley Abbruzzi, who was second in open flat. CMU scored 17 while Adrian College, in their first season of IHSA competition, earned 11. Besides Turner-Schimmel sophomore Brittanie Terrel was also a yellow ribbon-winner, having placed third in walk-trot. Saginaw Valley State is back in the IHSA after a few years without a team, and at today's show freshmen Courtney Trares was second in beginner walk-trot-canter to lead SVSU toward six points. Also with six was Calvin College. Calvin was led by freshman Lindsay Blair, who was second in novice flat. Though Hillsdale College (made up today of only senior advanced walk-trot-canter rider Jennette Engle) and College for Creative Studies (made up of only senior novice flat rider Aileen Snyder) were unable to score, both schools will hopefully have better luck at Albion. The March 1st competition will likely be the final undergraduate IHSA competition for both riders who showed today. Though Region 4 does not currently have alumni, it cannot be ruled out that the division may one day surface in the Great Lakes State. More IHSA history to be made: Anyone traveling to Findlay, Ohio on March 15th will see two shows for the price of one (these shows are free by the way). Though Region 4 is very happy to be made up purely of Michigan schools, hunter seat riders who qualify for Regionals will compete at Findlay in the first-ever overlapping Double-Regional show. Using one judge and the same horses, riders in Region 3 will compete in one section of open fences followed by riders from Region 4 doing likewise. Then the same process will be repeated for intermediate fences, novice fences and so on. Though there are regions which are geographically closer in other parts of the country there is no indication that this has ever been attempted before. It would appear to be a great idea if the number of qualifiers is not too great. To have the same horses and judge is likely also a money-saver. Who knows? If the concept works you might see overlapping Zone shows or even - time permitting - a regular season show where two regions compete at the same facility on the same day. For the time being, the March 15th show looks like good value for your money. Show Incidentals: Cloudy skies, with temperatures in the mid 30's. Entire show held indoors in a heated facility. Start time: 10:29AM. Finish: 5:34PM - includes 83 minute lunch break/Coaches & Captains meeting and additional schooling breaks. Point cards posted in this region? No, however a scoreboard with division-by-division points was posted and updated after each division was completed. Alumni Classes held in this region? No. Judge: Mike Hansen. Stewards: Miller/Adrian College, Zetting/Albion College and Tompkins/Grand Valley State University. Team Totals: Grand Valley State University (High Point Team) 44; Oakland University (Reserve) 40; University of Michigan 38; Michigan State University 33; Albion College 31; Western Michigan University 24; Central Michigan University 17; Adrian College 11; Ferris State University 8; Calvin College 6; Saginaw Valley State University 6; Hillsdale College 0 and College for Creative Studies 0.